Ok, so this is a very special blog post- why? Because....it is my very first blog post from my brand new shiny iPhone! That's right I have joined the brigade and picked up my new BFF yesterday after waiting what felt like forevvvver for an upgrade! It has lived up to all expectations so far being a hundred times better than my old Blackberry, so it is safe to say I am one happy lady right now! But, on with the post! Nail art is crazy at the moment and I for one am a sucker for it! I can spend many hours (and a lot of patience) jazzing my nails up to match my outfit with an array of different varnishes and art pens! I love my nail art so much that the thought of using Nail Wraps felt like the cheats way out, however, this week I succumbed! 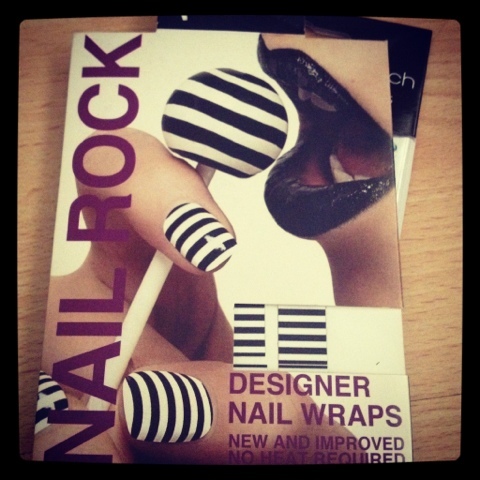 I was in a bit of a rush and I had some Nail Rock Wraps in my drawer for ages and decided- what the hell lets try these bad boys out and I have to say, I am more than a little impressed! They were easy to apply and much quicker than having to wait for various nail varnishes to dry! I have had them on for almost 5 days now and bar a few scuffs along the edges of the nails they look as good as when first applied! I have also received lots of compliments about them when I have been out and about which is always a bonus! They have instructions on the packet to aid application although I suggest you cut them down as well as file and shape them as this was much quicker and had a neater finish. What do you think? Are you a fan of the stripes? 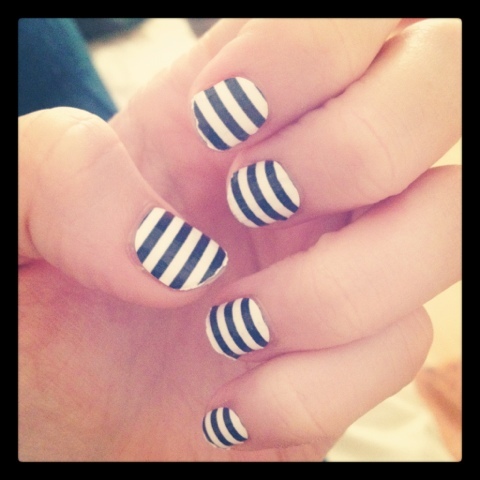 Let me know and share links to any other nail wrap designs you have tried I'd love to see!